This is a translation of brief excerpts from Enrique Ayala Mora’s “Manual de Historia del Ecuador” (“Manual of the History of Ecuador”) -pages 43,44,50 & 63-68. This manual is a very condensed version of the History of Ecuador. 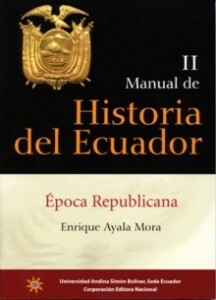 Other books by Dr. Ayala Mora develop the history of Ecuador in much greater detail; this manual is intended for a relatively fast, high-level overview. The final decades of the nineteenth century were marked by an ideological attack of liberalism against the landowner-clerical dominance. The complex and rigid interrelation between the State and the Church was questioned and attacked. The Concordat and the the political participation of the clergy were the the strongest points of confrontation. The liberal ideologues proposed a renegotiation of the pact with the Vatican which would remove the ideological monopoly of the clergy and allow freedom of conscience and the press which were limited by ecclesiastical censure. They also denounced the political “intrusion” of the clergy not only as a violation of constitutional guarantees, but as an inconsistency with the character their ministry. The Church resisted the attack. They fought liberalism backed by the catholic literature of Europe and the papal documents which maintained a “divine right” of the authority and the necessity to keep the altar and the throne united. They condemned all the liberal documents en masse taking care to include with them the “catholic liberals” who had appeared in the country. Bishops and priests jealously exercised their right to ban books and newspapers, demanding state support for the implementation of their decisions. Several newspapers fell victim to censorship. There was even an incident where a member of congress was expelled because he had been excommunicated. Liberal ideas had evolved from the time when they represented the defense of republican ideas against “strong governments”, until they reached the point of defining themselves as an ideological system that questioned the character of the state in the name of new concepts of authority and freedom. This radicalization of liberalism reflected the socio-economic changes and the presence of secular media groups. For a time, the Church managed to retain its place in politics, repressing liberalism. But the situation was changing. On the coast, especially in Guayaquil, secular insitutions grew up; charitible institutions, secular private schools, masonic lodges. The organization of artisans and workers was free from ecclesiastical control there. In Guayaquil there were several newspapers that operated as companies. The clergy had no influence on them. In mountain towns the Church held control over ideological and cultural expression, but that domain was precipitating a virulent reaction from minorities radicalized by a very active anti-clericalism. The clergy found itself confronted by a group of liberal intellectuals who were very aggressive and who disputed their social space. After the collapse of the Garcian system, a period of political definitions opened up. The electoral reforms of 1861 and 1883 expanded the electorate. Increased political participation and various forms of organization flourished. The ways of attracting votes (manifestos, newspapers, accessions, etc..) multiplied. At the same time, electoral clubs and societies spread across the country. Thus was founded the first “party” politics. The forces advocating the system of Garcian succession tried to group themselves into what was the first political organizati0n in history, the Republican Union, which appeared in 1883 with the internal break between the “Terrorists” and the “Progressives” who governed the country for somewhat more than the decade leading up to 1895. The liberals, for their part attempted to organize although there was a disagreement between those who participated so closely with the opposition that they were seen as a “left wing” of the progressive governments1, and the radicals who resisted militarily and who transformed into their most clearly defined opposition. These were the protagonists of the guerilla bands(“montoneras”) of the coast. From the time of the establishment of the “Republican Society” other liberal societies had been formed especially in Guayaquil. In 1890 a Congress convened which established the National Liberal Party. These “paleo-parties” were an innovation. They aligned themselves with specific forms of political organization, with ideologies, government programs, some rules of operation and forms of organizational structure emerged. They were an improvement over the old forms of political control bosses, but may be considered an extension and sophistication of them. These attempts at party organization and, in general, the growing tendency to consider “the political” as an autonomous sphere were symptoms of the emergence of modern features of the state, seated still on pre-capitalist basis. The scandal of “the sale of the flag” became a national crisis. In Guayaquil there was a request that the transaction be investigated and that President Cordero resign. In various locations on the coast there pronouncements calling for the supreme command of Eloy Alfaro, and the guerrilla organization (“montoneras”) was reactivated. A group of liberal highlanders attempted to reach a concurrence with the remnants of the progressives but this failed. Cordero resigned, transferring power to vice president Vicente Lucio Salazar, who had the support of the conservatives. But it was too late. The focus of events shifted to Guayaquil. Alfaro had strong resistance among the notables there but on June 5, 1895 he was proclaimed Supreme Leader (“Jefe Supremo”) under popular pressure. The notables of the port (ie: Guayaquil) had to accept the leader. Their participation ensured the mobilization of the people and the conduct of the civil war that was on the way. The pronouncement brought the bourgeoisie into a conflict with the peasantry of the coast in a fight for land; artisans and middle groups played the leading role in the ideological struggle. Alfaro was born in Montecristi, Manabi Province on June 25, 1842. His parents were Manuel Alfaro, a Spanish merchant, and Natividad Delgado. His education was piecemeal. Early on he devoted himself to business and politics. In 1864 he participated in a conspiracy against Garcia Moreno. He travelled to Panama where he married Ana Paredes Arosemena. While there he met Juan Montalvo4. In 1875 he returned to Ecuador and he confronted the government of Borrero. Months later he fought alongside Veintemilla who he later opposed when he failed to fulfill his liberal agenda. Alfaro led various revolts against Veintemilla from 1880. Between 1882 and 1883 he was proclaimed Supreme Leader (“Jefe Supremo”) of Manabi and Esmereldas and he directed one of the armies that overthrew the dictator (ie Veintemilla). In 1884, with Caamano in power, he led a new guerrilla uprising (“montonera”). He traveled through South America and met important Liberal Leaders. In Central America he had great influence. He became a general of the Nicaraguan army. Alfaro came from Central America and took over. He tried to avoid confrontation and sent peace commissions to the highlands. But conservatism had become radicalized. Salazar’s government went to war. The church launched a campaign of ideological terror against liberalism. The mediation having failed, Alfaro advanced to the highlands. He was victorious in San Miguel and Gatazo. On September 4 he entered Quito. The Civil War was also a regional confrontation. It reinforced the anti-liberal movement in the highlands but it consolidated the unity on the Coast. The Liberal Revolution began in the midst of a Latin American context of agitation. In neighboring Peru and Columbia revolutions broke out in those same years. In Cuba, Marti and other heroes intensified the struggle for independence. These events reinforced the existence of a species of “international liberalism” operating in Latin America. Alfaro balanced his cabinet with various sectors of liberalism. This caused turmoil among the radicals and it didn’t calm the moderates. Although Alfaro intended a rapprochement and addressed a conciliatory letter to the Pope, the clergy and the conservatives launched a crusade to regain power. Prelates like the German Schumacher and the Spanish Massi, bishops of Portoviejo and Lojo, encouraged armed invasions. Members of the “Catholic Restoration” crossed the border with the support of Columbia, entered the territory and came close to Quito. In July 1896 conservatives from Cuenca revolted under the leadership of Antonio Vega. Alfaro defeated the rebels and took the capital of Azuay. The repression was harsh. Property was seized from the leaders of the revolt and a journalist of the opposition was shot. Amid the tension the government pursued public works, pushed through tariff reforms and the suspension of foreign debt. In an act of solidarity Alfaro petitioned the Queen of Spain for the independence of Cuba. He also convoked an International American Congress which was to meet in Mexico in 1896 but it failed primarily because of the American attitude. In 1896 the Constituent Assembly met in Guayaquil, where there was a fierce fire that consumed nearly a third of the city. In the Constituent Assembly moderate Liberals were brought face-to-face with radicals. The new Constitution established freedom of Conscience and Religion. That created a conflict for the validity of the Concordat. Don Eloy, who had been elected president, did not want a break with the church but only to force it to accept the reforms. The attitude of the Church, however, was rigid. In 1899, to subdue the clergy, the Law of Patronage was passed5. The bishops did not accept it. In 1900 the Civil Registry was established and the cemeteries were secularized. The Church-State rupture was widened and there were armed clashes. The government expelled several bishops and priests. In 1900, conservative refugees with support from the government of Columbia prepared a new invasion. Alfaro helped the liberals of a neighboring country to conspire against the conservative government of Bogota. When war seemed inevitable, the attitude of the Bishop of Ibarra, Federico Gonzalez Suarez prevented it. He was the first church leader disposed to coexist with liberalism. Finally, the Vatican agreed to negotiate and the apostolic delegate Gasparri met with the government minister Peralta in 1901. They reached limited accords that were not fulfilled. In 1897, Alfaro signed a contract with Archer Harman who formed a company to build the Trans-Andean railroad. The work faced much opposition, even from liberals and notables of Guayaquil, but the contract was authorized. Alfaro supported the work with large fiscal resources. This led to resistance to the foreign company, renegotiation of foreign debt and higher taxes on foreign trade to finance the work. The government undertook a reform of customs and tax collection on the coast to the society of public credit, a private company. There were changes and foundations in official education and advances were made in the organization and training of the armed forces. In 1900 he discovered the remains of Mariscal Sucre, which had been interred in the Cathedral of Quito. That year, Ecuador participated in the Exposition Universelle in Paris. Amid the threat of invasion, Alfaro agreed to support the succession of General Leonidas Plaza Gutierrez who had been elected president. The new president had gained prestige as a defender of liberal theory and a good negotiator. The election had scarcely ended when Alfaro tried to force him to resign, but Plaza had reached an agreement with his opponents and controlled Congress and the Military. The Old Campaigner had to transfer power in August of 1901 but this formalized the division of liberalism. Plaza strengthened his government integrating the notables of the coast and he secured the support of various opponents who helped him control the army. In this way he was able to isolate Alfaro and his inner circle. With a policy of non-intervention in Columbia he was able to neutralize and finally stave off the conservative threat from the north. The president went further and gave positions to conservatives. Plaza realized the most radical reforms of the Secular State, many of which Don Eloy himself considered premature. The president’s strategy focused the attack on the Catholic Church while simultaneously offering guarantees to the landowners of the highlands. Focusing on the clergy as the target he managed to cause the rupture between church and state. But at the same time the government did not attempt any agrarian reform and guaranteed the repression of the workers. The Plaza strain of Liberalism (“placismo”) would be defined and consolidated in the first decade of the century. It represented the notables of Guayaquil, the landowners of the highlands converted to liberalism, conservative “collaborators”, professionals and businessmen, journalists and intellectuals, -all united in opposition to the Alfaro strain of Liberalism, contact with the person and family of Plaza and linked to the “Commercial and Agricultural Bank”. Plaza maintained respect for the opposition press, permitted the return of expatriates, but continued to control the elections. He was not in agreement with the Railroad Contract but preferred to reform it rather than suspend the project. In the territorial negotiations with Peru, the government maintained an erratic and inconsistent policy that hindered the arbitration that the King of Spain should have exercised over the dispute. In 1905, Plaza supported the candidacy of his former adversary, Lizardo Garcia, manager of the “Commercial and Agricultural Bank”. The opposition liberals tried to resist the “continuation” but the government imposed Garcia as president. Despite the support of economic interests, the new administration was weak. In December of 1905 he was overthrown by a military revolt headed by Alfaro who became dictator as head of one liberal movement emerging from a struggle against another. The military garrisons (with Riobamba and Guaranda in first place) staged the event. Guayaquil was one of the last places to be taken (January 14 to 16). The majority of the Liberal notables of Guayaquil backed Garcia. Alfaro triumphed against the bulk of the bourgeoisie with the backing of the army, popular groups, historical intellectuals of liberalism, a minority sector of the bourgeoisie with industrial interests, the Railroad Company, and the situational support of a sector of highland landowners with industrial interests in need of protection. Don Eloy gained this support to “save the revolution”. The liberal secular reforms and the the Railroad were included. The attempt of the bourgeoisie to win the political leadership excluding other sectors of liberalism had been premature. Alfaro moved forward a program that established the definitive institutionalization of the Secular State, the completion of the Railroad and the implementation of measures to protect and develop national industry. Faced with popular expectations, he returned to talk of social reform. The Constitution of 1906 institutionalized the liberal reform that had been completed two years after the nationalization of several estates of the Church. However, this measure did not bring the distribution of land to the peasants but only a change of tenants. On July 25, 1908, the Trans-Andean railway was opened. It was a great moment for Don Eloy. But the Railroad left the government with a monstrous debt and without its basic premise, more so since the project did not have the immediate effects that had been expected. After an attempt to establish a system of industrial protection, the government yielded to pressure from merchants and abandoned its timid industrial projects. The Alfaro movement (“alfarismo”) lost its social bases. On April 25, 1907 the Universities demanded elections not controlled by the government and were suppressed. This underlined the divorce between Alfaro and the Liberal intellectuals. Weeks later in Guayaquil the president suffered an attempt on his life. The failure of industrial protection was seen as a power opportunity by the opposition. The government gave customs revenues to the National Commercial Company, CNC. The reaction was widespread frustration of popular groups and Alfaro’s loss of leadership over the Army. The Old Campaigner had suffered a violent physical deterioration, but was able to preside over the commemoration of the anniversary of August 10 in 1909 and in 1910 to lead the national response to the announcement that the King of Spain was preparing his arbitration opinion against Ecuador in its dispute with Peru and he marched to the border to lead the army. The country supported him, but he missed a new opportunity to fix the territorial dispute. For the 1911 Election, Alfaro selected Emilio Estrada as candidate. His nephew Flavio Alfaro launched his own candidacy with military backing. Alfredo Baquerizo Moreno was nominated by liberals of the Plaza strain and sectors of the conservatives. Alfaro ensured the success of his candidate. However when he tried to force Estrada to resign the presidency before assuming it, Estrada refused and secured the backing of opposition liberals and the barracks where General Emilio Maria Teran -who was assassinated- had influence. On August 11, 1911 confronted by a rumor of a coup against Alfaro, the barracks revolted. A coalition of Plaza Liberals and conservatives disavowed the government. Don Eloy resigned and traveled to Panama. Assuming the Presidency in September of 1911, Estrada consolidated his support, forming alliances with his adversaries. Although he was linked to industrial interests and with the CNC, he sought support from Plaza Liberals. But the president didn’t last long. He died on December 22. Carlos Freile Zaldumbide took office. Immediately there were armed uprisings in Esmeraldas and Guayaquil, led by Flavio Alfaro and Pedro Montero who called Don Eloy who returned attempting to become a mediator. But the Government of Quito refused any settlement and sent the army commanded by Generals Plaza and Andrade. The rebels were defeated in Huigra, Naranjito and Yahuachi. An agreement negotiated by diplomats provided for the peaceful surrender of Guayaquil. Alfaro, Franco, and other Leaders were taken prisoner. In the midst of a trial, Montero was killed. The Old Campaigner and his companions were sent to Quito where a crowd stormed the panopticon6 in which they had been imprisoned, killed them and dragged the bodies through the streets to El Ejido park where they were incinerated. There has been much discussion about the responsibility for the event and although not everything is clear there is evidence pointing to criminal complicity on the part of Fraile Zaldumbide and his government. The Plaza Liberals, along with conservative clerics incited the crowd. Along with Alfaro, the radical alternative was defeated. In 1895, a leader was needed for Liberal triumph. Alfaro, radical popular leader and a great military leader, was the man. But his presence in power came with a price that the dominant groups were increasingly reluctant to pay. Alfaro promoted the secularization of the state and also its modernization, including industrial development, organization and craft workers, and to some extent, liberation of the peasants. This alienated the support of the bulk of the Bourgeoisie and of the powerful landlords which led to his downfall and murder. Popular mobilization and reform plans were limited but sufficient to alarm the oligarchy who feared that Alfaro would go further. The radicalism that was his advantage in 1895 was now a liability once the secular reforms were done. Then it became necessary to get rid of the Old Campaigner who had become a victim of his historic role of revolutionary leader. The fundamental task of liberalism was the secularization of the State. Although since 1895 there had been differences in the official attitude toward the Church, there was a consensus in the government regarding the need to reform the Concordat, so as to ensure freedom of Conscience and the prohibition against the involvement of the clergy in politics. To achieve this, Alfaro maintained a policy of appeasement, even to the point of defying the radicals. But the Clergy responded with a “Holy War”, while the Vatican maintained a posture of expectation, not wanting to negotiate. Confronted with this situation, the government suspended the Concordat and returned to the exercise of the Patronage (ie: the Royal Patronage -government right to appoint leading ecclesiastics). Early on, it attempted to avoid the separation of Church and State, simply subjecting it to the civil power. But this attempt was resisted by the Church Hierarchy. After the failure of the treaties of Santa Elena in 1901, resumption of relations seemed impossible and a controlled break was imposed which consummated the separation but part of the assets of the church remained under state management. This was stated by President Plaza who favored “Explicit recognition that the Church does not participate in our political organism and that its officials should consider themselves as dependents of a foreign power and that we should view them under that standard”. During the government of Plaza the most radical changes were made. In 1902 the laws of civil marriage and divorce were issued which put the celebration and dissolution of the conjugal contract under state control. The reaction of the Church was very strong. The government was accused of “authorizing public concubinage”. In 1904, the “Law of Religion” (“Ley de Cultos”) was passed regulating the functioning of the Church and religious communities and put their properties under state management. By the constitution of 1906, the separation of Church and State was consummated. The church lost its status as the official religion and legal personality in public law. In 1908 the Church Properties of the Dead Hands were nationalized. A major point of State-Church contention was the control of the Catholic Educational Institutions, many of which were maintained as private institutions. Over time they had multiplied. Thus were planted the seeds of confrontation between the systems of the lay state and religious education. Regarding this, the ideological debate lasted more than a half-century. The material projects of the Liberal movement were big. The network of roads and telegraphs was expanded, urban improvements were made and public buildings were built. The trans-Andean Railway was its major achievement. A company based in the United States – The Guayaquil and Quito Railway Co. was the licensee, with the controversial Harman as its front. The project was financed with investment, the result of renegotiation of the debt of independence. The bonds were guaranteed by the state, covering a substantial part of the financing. After enormous difficulties and unanticipated expenditures, the railroad was opened in 1908. Before its completion, it had already faced resistance from the landowners of the highlands who feared that the construction would bring higher prices and flight of the rural labor force, and price increases. Once completed, the Railroad line was not profitable but it did manage to unite the highlands with the coast, transforming it into the backbone of national integration. The liberal governments felt that the consolidation of their political success depended largely upon the establishment of a mechanism of ideological reproduction. One of its concerns was the establishment of an official secular educational system. Within a decade, the educational centers were siezed from the Church. Furthermore, many new ones were founded like the Mejia National Institute. The content of the new educational system was strongly anticlerical and influenced by positivist streams of thought in vogue. The training of the new type of teachers for the secular establishments was a problem that came into conflict with the normal schools founded for preparation of teachers. University education was secularized and theological studies were suppressed. The modern study of the Humanities was implanted in High School curriculum with great effect. New teaching methods were tested. Several special schools were created. After more than a decade, the system of secular education was consolidated. In 1911 there were 1,197 public schools out of a total of 1,551 schools, 1,484 secular teachers out of a total of 2,526 and 92,947 of 124,113 students. There were 11 national colleges and seven private schools with a total of 2633 students. The state intervened in charity. It encouraged the Guayaquil Private Board of Charity and statutory boards were established in the rest of the country. To these they gave the church property. Others remained in the hands of the diocese for education. It did not give land to the peasants. The government retained the ability to negotiate control of these estates with local landowners. The liberal program included, in addition, the nationalization of cemeteries. An important but forgotten aspect of the program was liberal grassroots organization. Having come to power based on popular support, Alfaro realized the need to keep his bases organized, especially the craftsmen. Thus he encouraged and supported the process of secularization of the workers organizations that were to be found in Guayaquil, Quito and other parts of the highlands. Don Eloy backed Miguel Albuquerque, popular figure of the liberal organization of the time who had founded several classist organizations, trying through Miguel Albuquerque to keep them under the control of liberalism. On the coast the plan was successful but in the highlands the right managed to maintain control. The secular state did not mean solely a change in the relations of power and ideology. The state apparatus experienced tremendous growth. The consolidation of the nation state also represented a strengthening of the mechanisms of central power and a great deal of centralization. The application of the liberal program brought a significant increase of public service. The Ministry of the Interior, the provincial administration and the Ministry of Finance, with its branches, grew rapidly. The number of bureaucrats in these branches increased at a rate of one to six. Moreover, both the increase in number of civil servants and military as well as the volume of public works demanded a growth in income from the treasury, which rose from seven to eighteen million sucres. At the end of the Liberal Revolution, in the administrative structure of the country, a sector of secular bureaucrats had been established, part of whom were women who, when appointed for the first time to public office, became one of the pillars of the Secular State . It thus extended urban groups that would meet an important role in the political and social life of twentieth century Ecuador.